Spring Tree & Shrub Sales Available now through April 19th. PICK UP DATES: April 26th and 27th at Farm Council Grounds (5055 Ann Arbor-Saline Rd). Extended deadline for online sales only. April 26th & April 27th: Tree & Shrub Sale! Friday, April 26th from 1-6 p.m. and Saturday, April 27th from 9-10:30 a.m at the Farm Council Grounds (5055 Ann Arbor-Saline Rd). Extra trees will be sold on Saturday, April 27th staring at 10 a.m. at the Farm Council Grounds. You will need to obtain a number card prior to the sale of extra trees during the tree pick-up times on Friday and Saturday. June 1st: Native Plant Expo & Marketplace. Saturday, June 1st from 9 a.m. to 2 p.m. at the Farm Council Grounds (5055 Ann Arbor-Saline Rd). Pre-order form is available for download here. Native plant species comparison chart available here. Interested in becoming a vendor for the 1st Annual Native Plant Expo & Marketplace on June 1, 2019? Find vendor application here. June 1st: Fish Stock Distribution with Harrietta Hills Trout Farm. Saturday, June 1st from 12 p.m. to 3 p.m. at the Farm Council Grounds (5055 Ann Arbor-Saline Rd). Distribution will be behind the Farm Bureau building in the Council Grounds parking lot. Look for the Harrietta Hills truck. Pre-orders only at Harrietta Hills Trout Farm. ​To assist landowners with, and provide leadership in, the conservation, management and wise use of natural resources of Washtenaw County. We assist land owners through a variety of programs, technical assistance and resource distribution. 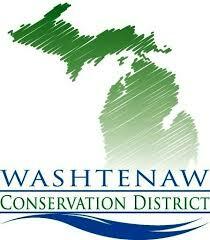 The Washtenaw County Conservation District is a local agency of state government.